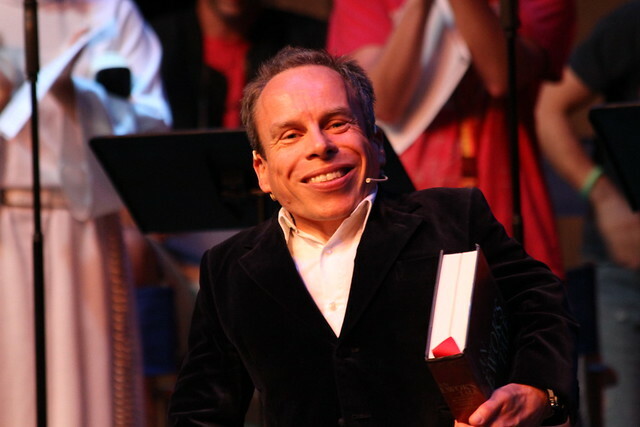 Leaving you this weekend with a short video of British actor Warwick Davis’s visit to a Nottingham primary school to explain dwarfism on behalf of Jasmine Chapman, a pupil with dwarfism who had asked Davis to come. Davis has starred in a variety of block-buster fantasy films alongside the likes of Daniel Radcliffe, Val Kilmer, Diane Wiest, and Carrie Fisher. While his average-sized co-stars have had careers expanding far beyond the fantasy genre, Davis has not. This is frustrating. As I’ve written before, it’s a problem that almost no disabled actors are famous, and the tradition of dwarfs in fantasy is complicated. Davis’s role in Ricky Gervais’s one-season-long series Life’s Too Short was even more so. But most primary school children are unaware of all that. And sometimes that’s a good thing. I had a crush on Davis as a child after first seeing him in Willow in 1988. He had a lovely speaking voice replete with British accent and long curly hairy and he ended up the hero. I bought it. I was blissfully ignorant of the clash between adults telling me I could be anything I wanted to be and the reality of the job market for people with dwarfism at the time. Children need heroes. I watch the video of nine-year-old Chapman sitting next to Davis as he explains that he and she are only different by virtue of their size and otherwise just like everyone else – sidestepping the intricate issues like chronic pain, necessary surgeries, disability funding, bioethics, political correctness, beauty standards, street harassment, and job discrimination. I watch the way he holds the kids’ attention by reiterating his lines as Professor Flitwick in the Harry Potter films. I watch it and I know that at Chapman’s age, I would have simply loved every minute of it.